The summer after graduation is filled with a lot of uncertainty for those of us who aren't going to graduate school in the fall and are still looking for post-summer employment. Sure, we're keeping busy now. I'm working no fewer than three jobs (two paid, one volunteer) and blogging in addition to job hunting and future planning. It's also important to me that I make time to hang out with my college friends who I won't be seeing as frequently come August and staying in touch with the ones who have already left Ann Arbor. Despite all that I'm doing now, I can never quite evade the question, "so what are you doing next year?" that follows me everywhere I go. Every neighbor, friend, and family member who doesn't already know my condition asks me this question within moments of saying, "hello." When my friends and I talk about our futures, it's often with a shrug and an, "I don't know..." followed with a swig of beer. It's an easy enough question to dismiss, especially when you can replace it with questions that have to do with the present: "What do you guys want to do today?" "Where should we get dinner? ""Anyone up for a movie later?" On the occasions when my closest friends and I have really honest conversations, the truth comes out: We're all scared. Not wide-eyed, scream-inducing, pee-in-your-pants scared. That would be a little too dramatic. However, the thought of the future is scaring the best of us. Many of us, for the first time, are going out into the world financially independent. Many of us are leaving home for the first time. More of us are going back home to "take time off" with or without our tails tucked between our legs. Many of us are about to begin graduate school, law school, or medical school and will find the course loads doubled and the competition more intense. Almost all of us are saying, "goodbye" to most or all of the friends who have become our family over the past four years. When you count up all these fearful things, I'd almost rather crawl back to bed and pull the covers over my face. Unfortunately (or luckily, depending on how you spin it), it's much too hot to sleep under all those covers or to stay in bed all day. Instead, the heat pushes us outside to be with friends or inside to coffee shops and computer labs where we're almost forced to continue job hunting and resume building. Plus, to be honest, I wouldn't have hidden in bed all day anyway. I'm just not that type of girl. I'm actually looking forward to starting life on my own. I just wish I had a better idea of when and how that might be. I can't tell you what I'll be doing next year because I have no idea. I can't tell you where I'll be for the same reason. In the midst of all this uncertainty, I often find myself grasping for something (Anything!) solid to hold on to. A little island of stability in the big sea of endless possibilities that is my life. To add one more component of stability that this blog has provided, I can tell you with absolute certainty what I will be doing October 21 of this year. The button over there ——> (top right hand corner) that says, "I'm baking a difference with Frosting for the Cause," will take you to the website where I will be guest posting a recipe for some form of baked goods that I will donate to a Women's Hospital or Cancer Society. The concept of Frosting for the Cause, is that for every day of the year, one volunteer will post a recipe and donate the baked goods to a Women's Hospital or Cancer Society as well as $25 to the Canadian or American Cancer Society. Every blogger will post a link to the main website on his or her own blog and tweet about it with the goal of raising awareness and inspiring new donations so that more research can be conducted to find a cure for those types of cancer that affect only women. 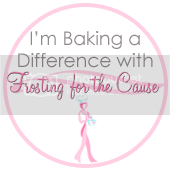 I will be baking and blogging often between now and October 21, (even more often if I'm unemployed come August) but be sure and visit both my website and Frosting for the Cause on October 21 for a special post. That's amazing! Frosting for the Cause sounds like an excellent charity event to display your baking talents and help those who are sick. Please keep us posted what you end up making!